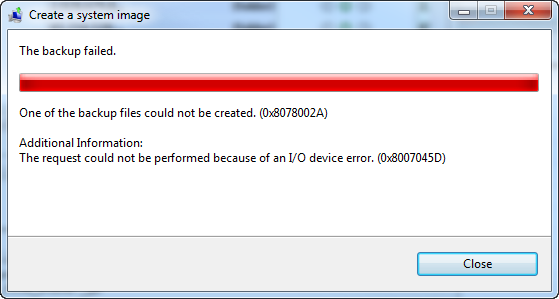 The Request Could Not be Performed Because of an I/O Device Error, What to Do? Solutions to fix the error: The request could not be performed because of an I/O device error (0x8007045D), received while backing up to a new hard disk drive (HDD). Both error codes 2147943517, in decimal, and 0x8007045D, in hexadecimal, represent the same I/O device error. If the error received when the backup has been in process for a while, there should be bad sectors on the backup source disk or destination disk. If the error received when the backup is about to finish, the last cluster on the volume may have gone bad. If you backup to a large drive that has a 4K sector size, rather than 512 bytes sector size, often used in HDDs smaller than 2T, you may get this i/o error 0x8007045d for the backup and restore tool on some old Windows versions is with standard file format relying on 512-byte sectors. Some security applications may prevent the backup utility from accessing the hard drive. You can close all the other non-system processes. You may also need to disable antivirus software temporarily. If the I/O device error persists, you can boot your computer into safe mode to try the backup again. This way will reduce the impact of third-party applications to a minimum. 1. Rress “Win+R” and type “cmd” in the box and press Enter. You should run it as administrator. 2. At the pop out command prompt, type in the following command “chkdsk X: /f /r” and press Enter. “X” represents the drive letter of the partition you want to check, “/f” represents the command to fix errors and “/r” to locate bad sectors and recover readable information. 3. After the process is finished, reboot and retry the backup task. Shrink or extend the partition to carry the last cluster to another location and run the “chkdsk” command again. In Disk Management, Right-click the partition you want to shrink, and click Shrink Volume. Then follow the pop out Shrink Volume wizard to process. You can also use third party software to resize partition without data loss. Format your hard disk drive to Factory Default with WD Quick Formatter tool and retry. Note that formatting your hard drive to Factory Default will cause it not recognizable in Windows XP and all the data on it wiped out, so backup hard disk if there is valuable data on it. If it still fails with the same error after these steps, your hard disk should be advanced format (4K) disk. You may consider switching another hard disk drive to backup to or upgrading your Windows in order to fix the problem that the request could not be performed because of an I/O device error. There are two types of advanced format (4K) disks, one is 512-byte emulation (512e), which reports 512-byte as its logical sector size and 4KB as its physical sector size, the other is 4 KB native, which has 4 KB as its logical and physical sector size. Advanced format (4K) disk with 512-byte emulation is supported on Windows 8,Windows Server 2012,Windows 7 w/ MS KB 982018,Windows 7 SP1,Windows Server 2008 R2 w/ MS KB ,982018,Windows Server 2008 R2 SP1,Windows Vista w/ MS KB 2553708,Windows Server 2008 w/ MS KB 2553708. To get the physical and logical sector size, you can run the command “fsutil fsinfo ntfsinfo <drive letter>” in an elevated command prompt. If it shows “Bytes per sector: 512” and “Bytes per Physical Sector: 4096”, this is an advanced format (4K) disk with 512-byte emulation. If both lines show as 4096, it is a 4 KB native disk. If it shows “Bytes Per Sector: Not Supported”, then the hard drive driver does not support IOCTL_STORAGE_QUERY_PROPERTY. If you still receive the error “the request could not be performed because of an I/O device error, you can try third party free backup software or upgrade your system. Advance Format 4K Native disk is supported on Windows 8, Windows 10, Windows Server 2012 (R2) and Windows 2016.